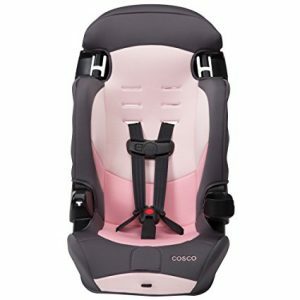 The Cosco Finale DX 2-in-1 Booster Car Seat is a Stage 3 carseat that is most appropriate for preschool and school-aged children. It is safe, lightweight, extremely budget-friendly and stylish. It is a new model for 2017, so you won’t yet find it on our Recommended Seats. It’s not too complicated to install, and is relatively easy to use properly. Its height capacity isn’t the highest on the market, but it’s reasonably tall for its price point. Combined with the 65 lbs. 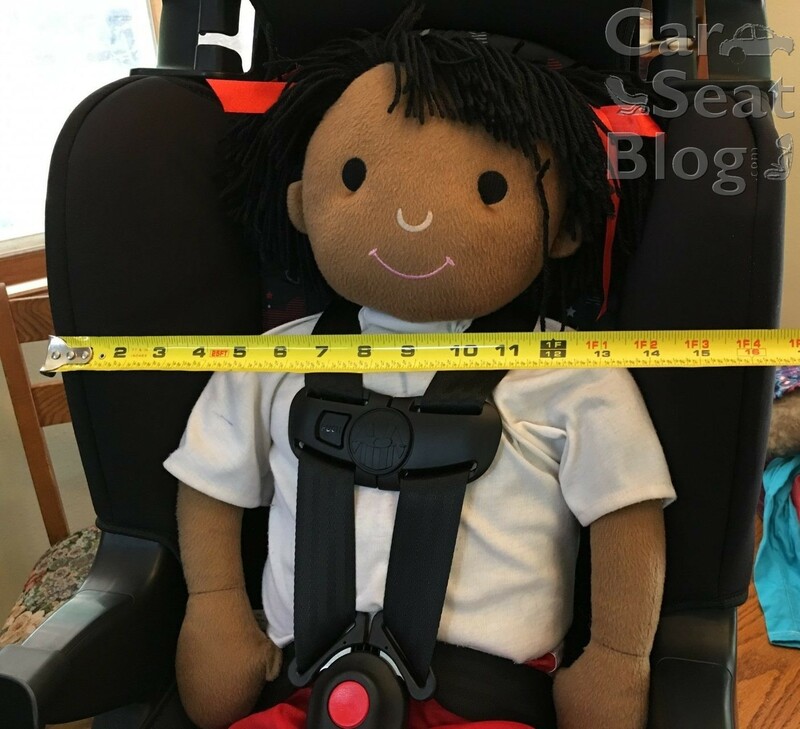 weight limit, it should fit most average-height kids (even heavier ones) in the 5-point harness until they are the age and size to safely transition to booster mode. The 2017 Cosco Finale is a forward-facing only carseat. 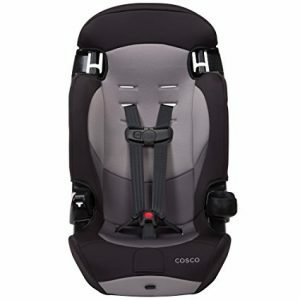 Cosco’s instructions indicate it is for kids at least 1 year old, although we would generally recommend at least age two because it does not rear-face. 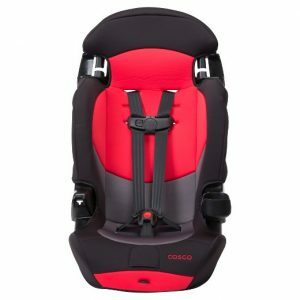 It can also be used as a highback booster for kids who weigh more than 40 lbs. Weight: 30 – 65 lbs. Weight: 40 – 100 lbs. Removable cup holder can be placed on either side. For more measurements, please see our Comparison database. Forward-Facing with harness: The minimum size requirement is a whopping 30 lbs. and 32″ tall. My small-ish 2.5 year old measured about 26 lbs and 34 inches in the photo below – she was tall enough but not heavy enough to use the seat. The minimum height requirement is realistic; I would not expect to be able to comfortably and safely secure a child under 32″ in height in this seat; at 34″ my daughter has room to grow before she maxes out the bottom harness position. 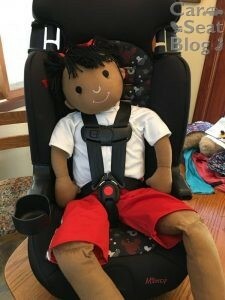 Reasonably tall top harness slots should allow most children to be harnessed until age 5-6 forward facing, until around 50lbs, maybe heavier for some kids. Some children will outgrow it by height sooner. The low profile seat allows child to get themselves into the seat with minimal help from parent/caregiver. 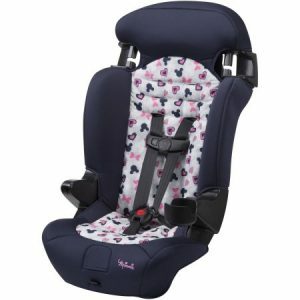 Highback Booster: The belt guide is problematic in some cars, not allowing it to retract properly, but the belt guide is only to be used if necessary to achieve proper belt fit and can be skipped for many kids. 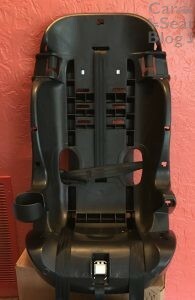 The head rest is non-adjustable. 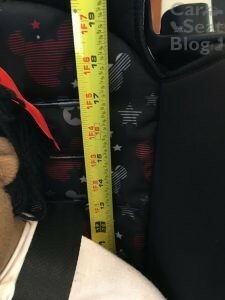 The 52″ height limit for booster mode is a fairly good estimate for the size of child who will actually fit in the seat. 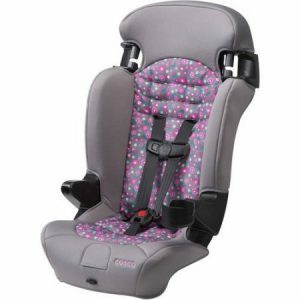 You will need another booster seat after the Finale is outgrown at approximately age 6-7 based on your child’s height. The Cosco Finale 2-in-1 Highback Booster Car Seat is a nice, lightweight, forward-facing carseat that is also budget-friendly. The reasonably-sized 17″ top harness slots combined with the 65 lbs. 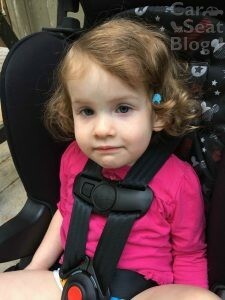 weight limit on the harness is enough to get many kids to the size/age/maturity to safely transition to a booster. 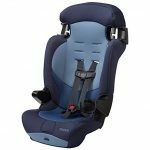 Just don’t expect them to use this seat very long in booster mode; you will definitely still need another booster after this seat is outgrown. You can install the Finale with LATCH up to a child weight limit of 50 lbs. 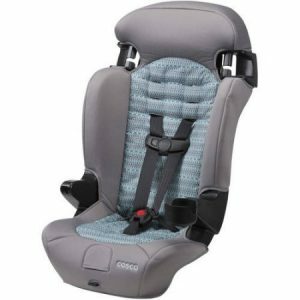 If installing with LATCH isn’t an option, then you must read your vehicle owner’s manual to determine how your seatbelts lock in order to properly install this carseat with seatbelt. 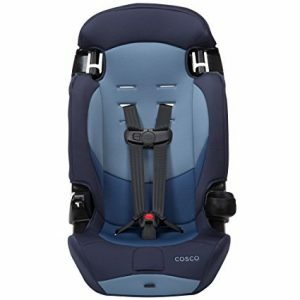 The Cosco Finale is FAA-approved for aircraft use. Given its light weight and low cost, it will definitely be considered for our list of recommended seats for airplane travel. Why can’t the latch be used in booster mode? Seems to me if you use the latch and the anchor while using the seatbelt in booster mode, it would be double secure … ? Just curious. 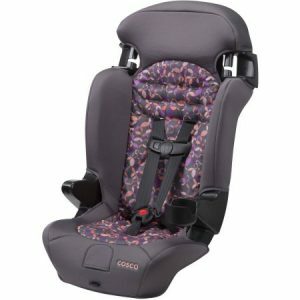 This is a protocol across all Dorel (Cosco, Safety 1st, Maxi-Cosi) products when it comes to their combination seats and use of LATCH in booster mode. I suspect the 50 lb LATCH limit is kind of a consistency compromise. All their other seats except the APT 50 (which also has a 50 lb LATCH limit) have 40 lb limits. They probably didn’t want too many different limits out there. This is just a guess of course, but it does make things simpler. I’m surprised that the lower anchor limit is 50# instead of 55#. Do you think there are some versions that weigh more because of fabrics or does Dorel just have a different scale? 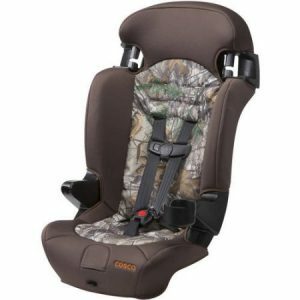 (I’m not sure how much that would matter for most children because of the top harness slot, but it makes me wonder.) I’m very glad Dorel has come out with something that is a much better option than their “high back booster” that had crazy low slots and a 40# limit.